Lighting Stores La Grange: Find Your New Fixtures Today! Updating your light fixtures might seem like a daunting task, but with the right store and the right staff, it can be a very simple and straightforward process. When you shop at Hortons in La Grange, you’ll have the assistance of our knowledgeable staff, who can show you every fixture option and help you decide on lights for every room in your home. They can also explain the three basic types of light each home has – ambient, task, and accent. Ambient, also known as general lighting, provides the overall illumination for a room or area of your home. It should provide enough light for people to walk safely through the space, but not be so bright that there is glare or unwanted shadows created by furniture and decor. 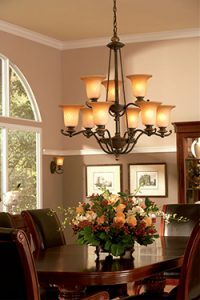 Flush mount fixtures, chandeliers, and ceiling fans with lights are good sources of ambient light. Task lighting is more focused, and does as its name implies – provides light for tasks such as reading, cooking, or doing homework. Pendants, track lighting, and undercabinet lights are great choice for task lighting, and you’ll find plenty of options in our showroom. Accent lighting is used to highlight a certain room’s features, or add dramatic flair to your interior design. If you have a textured wall or artwork that you want to accentuate, recessed fixtures and spotlights can accomplish your goal. No matter what type or style of fixtures you’re searching for, Hortons can help you find the ideal options. Stop by our showroom at 60 S La Grange Road, or visit our other locations in Chicago and Orland Park!